The tank barge is one of two identical vessels being construct- ed by Jeffboat for Boston Fuel. May, the tanker is a mammoth, single-skin, oceangoing barge which can transport some 36,000 barrels of fuel. Its sister barge will be launched in mid-October. Both barges are 18 feet high, 60 feet wide, and 260 feet long, and contain living quarters for a two-to-four crew. Transportation Company. This tanker will be 22 feet deep, 60 feet wide, and 325 feet long, and will increase Reinauer's fuel- carrying capacity by 60,000 bar- rels. 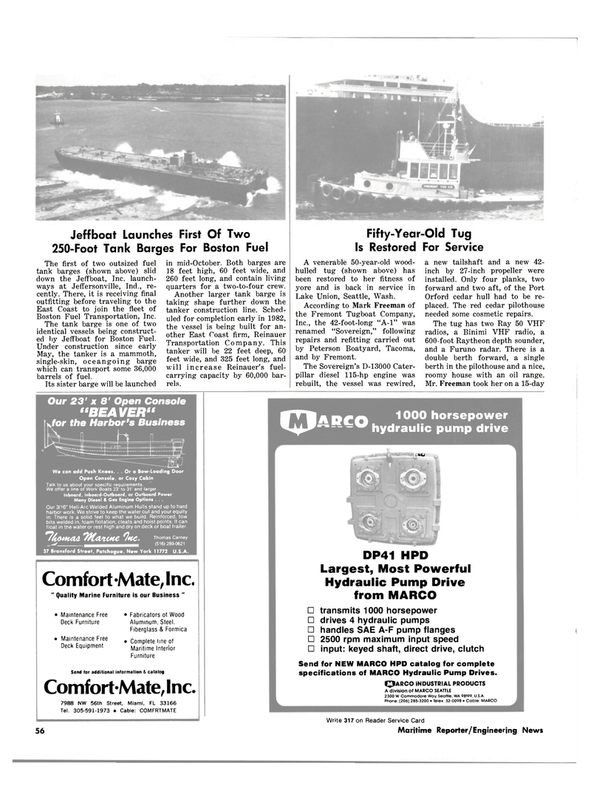 Inc., the 42-foot-long "A-l" was renamed "Sovereign," following repairs and refitting carried out by Peterson Boatyard, Tacoma, and by Fremont. Orford cedar hull had to be re- placed. The red cedar pilothouse needed some cosmetic repairs. The tug has two Ray 50 VHF radios, a Binimi VHF radio, a 600-foot Raytheon depth sounder, and a Furuno radar. There is a double berth forward, a single berth in the pilothouse and a nice, roomy house with an oil range. Talk to us about your specific requirements. We offer a line of Work Boats 23' to 31' and larger. Many Diesel & Gas Engine Options . . .
A division of MARCO SEATTLE 2300 W. Commodore Way, Seattle. WA 98199. U.S.A.